TSN Hockey Insiders Bob McKenzie, Darren Dreger and Pierre LeBrun joined host James Duthie to discuss what the next steps are for the new Seattle-based franchise, what Chuck Fletcher might do first in Philadelphia and the latest with Mitch Marner and Auston Matthews now that the William Nylander situation is resolved. What’s the next step for Seattle? Now that the city has been approved as the league’s 32nd franchise, what comes next as things build up to puck drop in 2021? LeBrun: Well they have to hire a general manager. The GM search is going to be paramount for the kind of success that Seattle wants to have in terms of hitting the ground running. Now, when they thought they were launching in 2020, the plan was to hire a GM in June 2019, which was 15 months out and was exactly what the Vegas Golden Knights did. That plan may very well change now because they have that extra year. I’m told that members of that Seattle ownership group have discussed over the last couple of days the merits of hiring a GM two years out – a full year ahead of what Vegas did. And it probably makes sense. I mean, if you accept the notion like a lot of GMs are telling us that it’s going to be a lot harder this time around expansion because all those teams have learned from their lessons of the Vegas experience. Then maybe the extra lead-in time is important. Having said that, as one member of the ownership group from Seattle told me Tuesday, if there’s a specific candidate that they really fall in love with and they have to wait for them, then they will. So they don’t want to push things ahead too quickly if it means missing the guy they want. 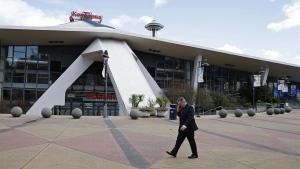 Dreger: It sounds like Seattle is looking for experience but you can tinker with the definition of experience. If we look at a potential top candidate like Ken Holland, you’ve got a wealth of experience and championship experience with the Detroit Red Wings. He’s under contract this year and next year so he could be a possibility and if he is a possibility, then he will be one of the front-runners. Then you look at the experience that Kelly McCrimmon had helping build the Vegas Golden Knights shoulder to shoulder with George McPhee. So there could be two top candidates. Beyond that, names like Mike Gillis, Dave Nonis, Laurence Gilman of the Toronto Maple Leafs, Bill Zito and a whole cast of other assistant general managers could also be in play. 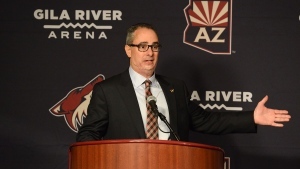 With an additional team coming to the NHL, the Arizona Coyotes are moving to the Central Division. How does that sit with them? LeBrun: Now, of course they also voted on re-alignment as part of accepting Seattle as a 32nd team. As we speculated for a few months now the Arizona Coyotes – for some reason – are going from the Pacific to the Central Division. It just felt like the easiest fix for the NHL. The league doesn’t like big re-alignments and it was very difficult the last time. We don’t think the Coyotes are terribly thrilled with this. They’ve known for a year that this was the leading option, but we were told that on the eve of the Board of Governors meeting that principle owner Andrew Barroway had some reservations about it. Well, too late. They had to vote it in and that’s how it’s going to be. Dreger: General managers from around the league are already preparing for an expansion draft and welcoming Seattle into the National Hockey League. There are teams from around the league that are already conducting mock drafts and the expansion draft process is going to be very similar to how Vegas was shepherded into the NHL, so teams are hard at work already. What are Fletcher’s priorities in Philadelphia? 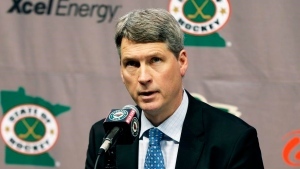 The Flyers named Chuck Fletcher executive vice-president and general manager on Monday. What might he do first once the dust settles? McKenzie: Well the No. 1 priority is getting back in the playoff race and to make the playoffs this year. A lot of people think Ron Hextall was fired and Chuck Fletcher was hired ostensibly because the ‘win now’ mentality is back in Philadelphia. That’s true to a certain degree, but don’t expect Chuck Fletcher to come in and start trading first-round picks or a prospect like Morgan Frost for immediate short-term help to try and get himself in the playoffs. I think there are two things on the to-do list for Fletcher. No. 1 is maybe finding a short-term fix in net. The goaltending hasn’t been good enough. And it could be a short-term but might even be a longer-term fix, but that is something they absolutely have to look at. The other one would be giving Dave Hakstol, the head coach, a fair amount of time for evaluation. Fans and media wanted this guy fired before Hextall. He needs to have the opportunity now to get something done. 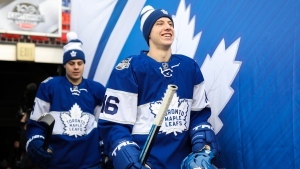 What’s the latest with Matthews, Marner? Now that the Leafs have sorted out the William Nylander situation, Kyle Dubas will soon need to turn his focus to Auston Matthews and Mitch Marner. McKenzie: I think the Toronto Maple Leafs would like to intensify the talks now that Nylander is done. 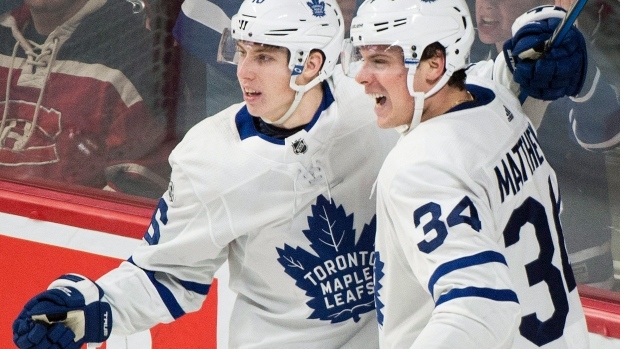 They’d like to get negotiations going to a greater degree with both Marner and Matthews. The first problem is, who goes first and who goes last? The sense seems to be that both guys would prefer the other guy to go first and then see where they’re at. And if nobody wants to go first then obviously the deal is never going to get done. So Toronto is trying to be proactive with negotiations but the potential Plan B would be to be more reactive. What about Mikko Rantanen, Brayden Point, Patrik Laine? All of those guys have spectacular numbers that in various areas compare to Marner and Matthews. Would if those guys go first?